Tata Motors, the country’s biggest truckmaker, is back in black at a standalone level in the third quarter, helped by sharp growth in revenues (led by volumes) and cost reduction. The company had incurred losses at a standalone level in the five preceding quarters. It reported a standalone profit of Rs 1.83 billion in October-December of FY18 against losses of Rs 10.46 billion in the corresponding quarter of the previous year. Standalone revenues (from its domestic business) for the quarter increased 59 per cent to Rs 161 billion. The Ebitda (earnings before interest, depreciation, taxation, and amortisation) of the standalone business margin improved 750 basis points to 9 per cent in the quarter. The performance is in line with analysts’ expectations. Commercial vehicles account for three-fourths of its standalone revenues while the rest comes from passenger vehicles. The share price gained over 3 per cent to close at Rs 396 at the BSE in anticipation of improved performance. The results were announced after the closure of the trading hours. 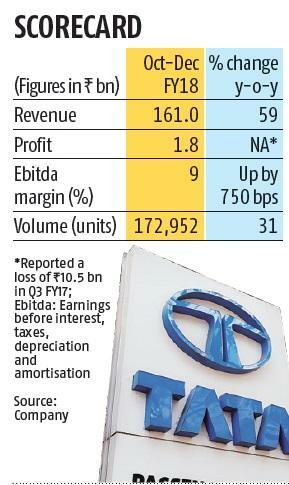 The “turnaround strategy” is delivering results, according to Tata Motors Chairman N Chandrasekaran. “Our focus on market share gain, coupled with operational improvements, is working well, with both the commercial and passenger vehicle businesses delivering improved results,” he said. Chandrasekaran said the company would continue to reduce cost and invest prudently in products. 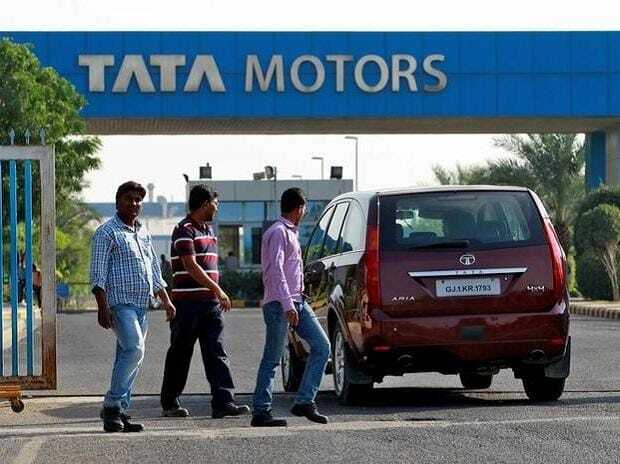 Tata Motors invested Rs 10.21 billion in products, platforms, and technologies during the quarter in its domestic business. Volume growth played a key role in profitability. The standalone sales volume during the quarter expanded 31 per cent to 172,952 units, showing strong growth in both passenger and commercial vehicles. The launch of products like the Nexon, Tigor, and Hexa helped passenger vehicle volume growth. The company had indicated last year its bottom line would improve by Rs 15 billion on account of volume growth and reduction in cost. No timeframe was specified for this reduction. At a consolidated level, the company reported profits of Rs 12.14 billion against Rs 1.11 billion in the corresponding quarter of the previous year. Consolidated revenues grew 16.1 per cent to Rs 741.56 billion during the quarter. The consolidated profits are lower than analysts’ expectations of more than Rs 30 billion. The pre-tax profit of luxury car maker JLR declined to £192 million in the quarter compared to £255 million in the corresponding quarter of last year (which also included a $85 million insurance recovery). The company said profitability at JLR was impacted by the run-out of certain models, higher depreciation, and amortisation, resulting from continued investment to drive profitable growth. The company invested £1 billion in new products, technology, and capacity during the quarter. Retail sales at JLR rose 3.5 per cent during the quarter to 154,447 units while wholesales increased 2.2 per cent to 133,739 units. JLR’s EBIDTA margins increased 80 basis points to 10.9 per cent in the quarter. With regard to JLR, the company said China and overseas markets expanded while the UK, the US and European markets declined, reflecting “challenging” conditions with cyclical weaknesses in the UK and the US, increasing diesel uncertainties in the UK and the rest of Europe, besides Brexit problems. Bharat Gianani, research analyst (Auto/Auto Ancillaries) at Sharekhan, said the company’s third results were in line with the estimates operationally. “Better than estimated performance of the standalone business led by strong operating leverage offset the lower than estimated operating performance at JLR,” he said.